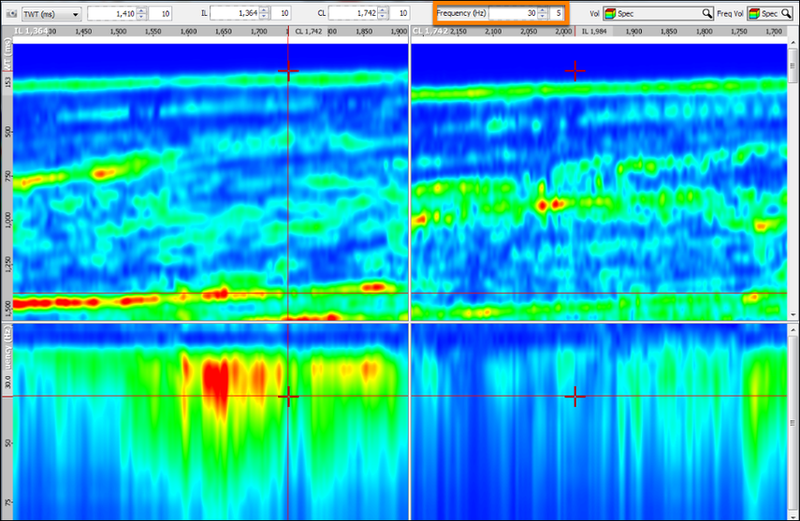 Description Decompose seismic data into frequencies using a continuous wavelet transform. The output is an amplitude spectrum for each input sample. Every input trace is decomposed into a number of user-defined frequencies. For each decomposed frequency, the amplitude of that frequency, at every sample, is generated as a separate trace. You can then display the output volume in section and gather views, as well as the specialised SD views. Select a 2D or 3D Input Volume. Note: This process cannot be run with gather volumes. The default parameters work well for most data types. 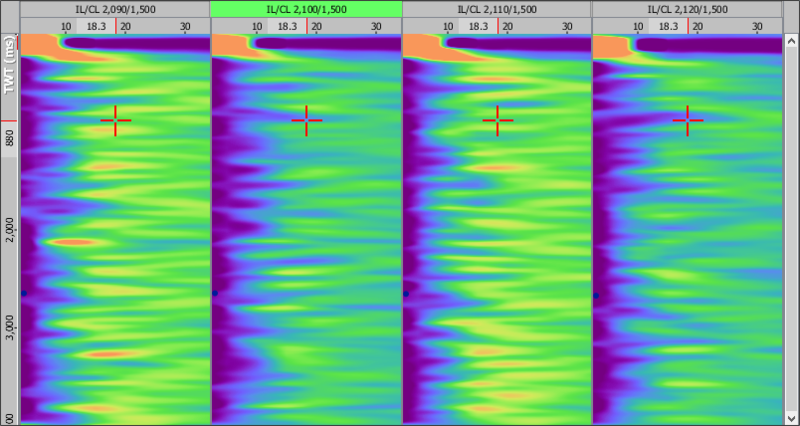 Adjust parameters depending on the data, geology and frequency content. Wavelet frequency (Hz): The range and increment (sequence) of frequencies to calculate for the spectral decomposition volume. Filter half-window (ms): The time window to be used in computing the frequency content of the signal. Reducing the time window will result in a higher resolution output for high frequencies, and is more suited to dealing with "thin-bed" geology. Number of passes for filter: The number of passes to filter to smooth the spectral decomposition output volume. As the number of passes for filter increases, the more the output volume will be smoothed vertically. 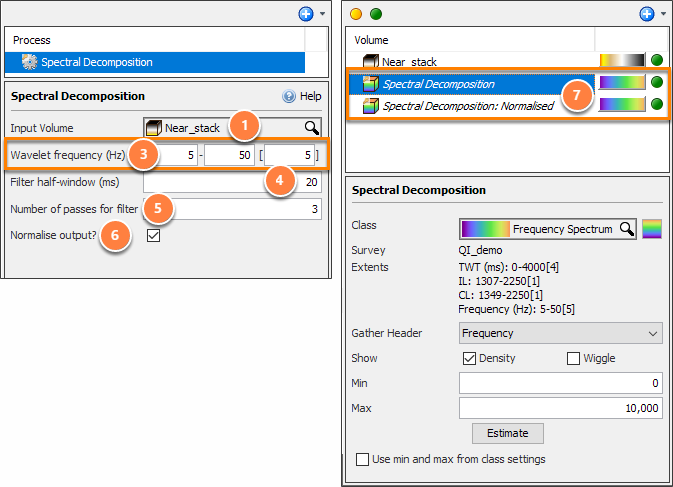 Normalise output: Generates a separate "Spectral Decomposition: Normalised" volume, which has amplitudes normalised against all the different frequencies in the specified sequence at the current point. The result is a new volume generated in the Volume tab. Tip: To open the output volume, right-click the process item in the Process tab and click Open the output volume. Vice-versa, right-click the volume and click Open the Process. Use Ctrl + P to quickly switch between process and the virtual volume. The resulting Spectral Decomposition volume can be shown in any view. 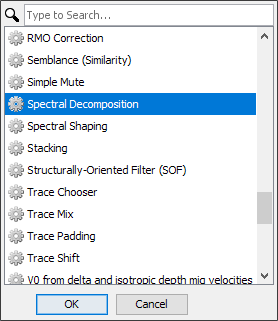 Select the spectral decomposition at the Vol drop-down box. Enter the frequency (hz) to view. Adjust the increment value (default 5) to control the step size when adjusting. Select the spectral decomposition at the Gather Vol drop-down box. To work with Gather view, see Opening a Gather View. The spectral decomposition volume can also be displayed as a time-slice that has been flattened (see Flattener) to a horizon of interest. Select the flattener process in the Map View > domain drop-down box. 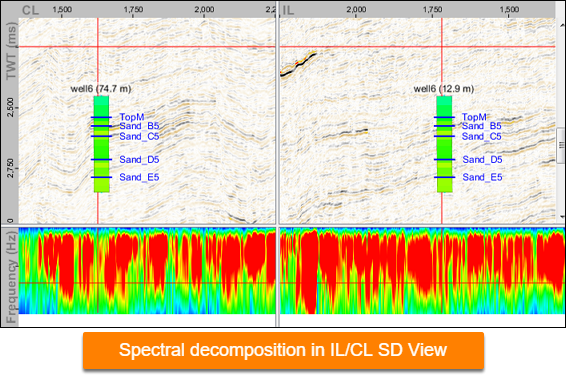 This allows panning through the data whilst conforming to the trend of the geology, better enabling the identification of geological features such as channel sands. Select the output volume at Freq Vol drop-down box. The horizontal gather display at the bottom shows the frequency gather at the currently selected time or depth. By default, red means high amplitude and blue means low amplitude. Use the TWT selection box in the navigation bar. Selecting the output volume as the Volume in the navigation bar will allow you to scroll through the frequency range and view the respective energy content (amplitude). The Spectral Decomposition output is calculated on the fly. Navigating through the volume, can be computationally intensive, and may be slow. Map slices will be slower than section views. 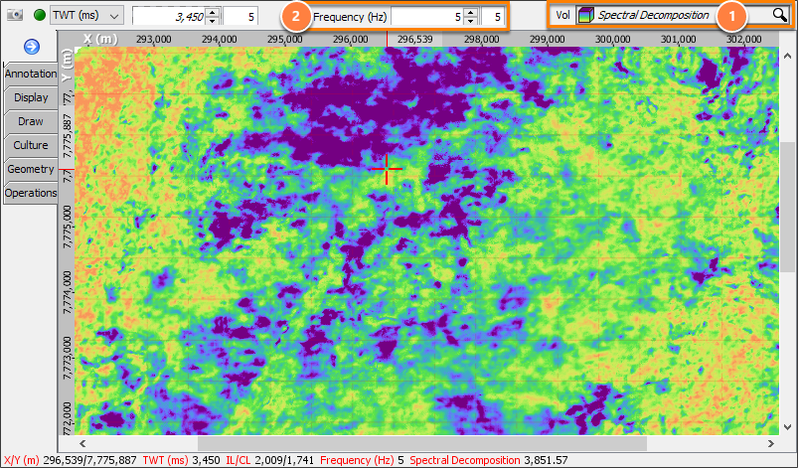 If you are experiencing poor performance, zoom to a smaller section of the map or export the Spectral Decomposition output volume to a .dugio volume (see Exporting to DUG I/O) and adding it back to the session. Note: By default, gathers are written in a structure that makes it extremely fast to retrieve but slower to read individual offsets and frequencies. The biggest penalty is when looking at frequency or offset slices from gathers in map view. The solution is to disable the "Optimise gathers" option when exporting spectral decomposition gathers. It's the option immediately below the Gather Extents field. Once the volume is exported, and added back into your session, you can improve the performance even further by creating optimised sub-volumes (see Optimising Volumes for Performance).